I like this event and go most years. It always takes place at the stunning Lancashire Cricket Club, Old Trafford, which nowadays is across the road from where I work, which is nice. The event has evolved from being in a windowless basement room inside OT to one which overlooks the pitch and is in the redeveloped part of the ground. It's also evolved from a lecture style event with Peter Wallington who just ran through recent case law, to more of a conference style event with multiple speakers and some interactivity. And today I'm in attendance as a CIPD Ambassador, helping to promote the event and to chat to delegates. Otherwise I may not have been able to come this year as the timing fell badly with my job move. The first fail of the day though happened early on with the provision of large printed delegate packs with all the slides. Who does that any more? Eventually I was able to find a way for the organisers to send me the stuff electronically, but it seemed very much an afterthought. Second fail was the confusion around and general lack of a Twitter hashtag for the event. Again, who does that? It took a few tweets by me to the organisers to get a hashtag put together, but this wasn't helped by some of the speakers appearing to not know what Twitter was or why people would use it at a conference. Anyway, the event started with a good talk from Ed Cotton from TLT. He spoke authoritatively about restrictive covenants and how to protect your business through their use. A lot of the examples were pertinent as they relate to intellectual property and use of social media, and how things stored on social media during the course of employment may constitute the company's IP and not the individual. Interesting. Also interesting was the extent to which restrictive covenants can be relied upon. I was surprised to see how some that are considered so restrictive can be got out of, and therefore can't be relied upon. The wording is therefore key, as is the overall reasonableness of the covenant. About halfway through the morning the hashtag arrived. Some of the later bits of Ed's talk focuses on the practical steps a company can take when a key member of staff is leaving. As I've recently left a senior role in an organisation it was interesting to compare this to what happened to me when I left, and also to compare to what practical steps are taken in my new senior role. It's immediately obvious that, if I'd been so minded, I could have done a lot of damage and that both my previous and current organisations may need to tighten up on some of the practical measures when senior staff leave. The next talk was from Stuart McBride from TLT on equal pay and the requirements to report on equal pay. This is new for many organisations in the private sector, but a common thing for those in the public and quasi public sector organisations such as those I've mainly worked in recently. Stuart went through the new requirements and how to calculate the gender pay gap ahead of the mandatory requirements for publishing this in 2017-2018. This was good advice if you've not done gender pay reporting before, and it's clear that your maths and statistics skills will need to be top notch to be able to do it. Although in this day and age I still find it difficult to understand why a gender pay gap still exists, but then maybe that's reflective of the sectors in which I've recently worked and maybe my exposure to such things has been limited. Stuart commented that gender pay gap reporting is as much about reputation and publicity as anything else, given that there are no additional civic penalties (other than those for non reporting), so the narrative that accompanies the reporting is perhaps more important than that data and the gap itself. So does that mean that peer and public pressure are going to be the main tools for closing any pay gaps? After the break Stephen Wyeth, a Barrister, gave a run through of the practicalities of preparing for a tribunal. Stephens' style was refreshingly approachable for a barrister (allegedly) and he gave some good practical advice about how you can make the most of a tribunal process. I've come close to a tribunal appearance on a few occasions but in each case it's been settled before its reached the court itself. So I've been spared, if that's the right way of viewing it, and this advice is useful if one day I ever find myself in front of an employment judge. I would just question the relevance of this advice for most of the audience, many of whom would instruct solicitors to do much of the preparation for them and wouldn't be doing it themselves. He gave us some good insight into Without Prejudice conversations, highlighting that they can only take place where there is an existing dispute, and there are limitations as to their use and disclosure. Another good discussion was around what is and isn't disclosable as evidence, with annotations on documents, and any information you saw or received on any social media site being considered disclosable. Stephen also advised anyone facing a tribunal to go and watch a case as an observer beforehand. This is very good advice. When I used to teach HR qualifications (classroom based as opposed to the online stuff I do now) I used to organise an annual visit to a tribunal and it was often the highlight of the entire course. 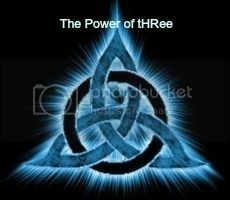 But I have a damned good understanding of how a tribunal works having now seen 5 or 6 of them in action. So I'd recommend this too. 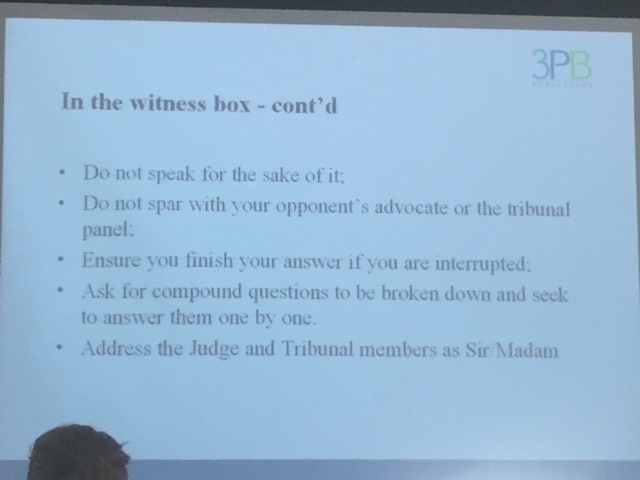 He finished by giving a run through of how you can be a better witness when giving evidence, including some of the points on the slide below. He also said be nervous, it will look better, but do it in moderation! And then it was lunch! I did suggest that we could move outside into the glorious sunshine for the afternoon, but to no avail. First speaker after lunch was the erudite Pete Monaghan from ACAS, who I've heard before but who is always entertaining. Petes' talk included some up to date information from yesterday's budget, but he started with a useful run through of the productivity challenges facing the UK, commenting on the numerical shortages we will soon face and the dangers of another recession looming. 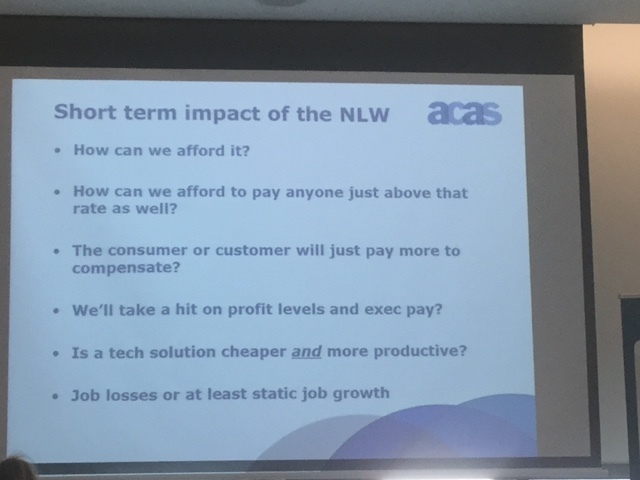 To be honest I'd not considered some of the potential downsides to the currently trumpeted NLW and so this was interesting stuff and made me think. 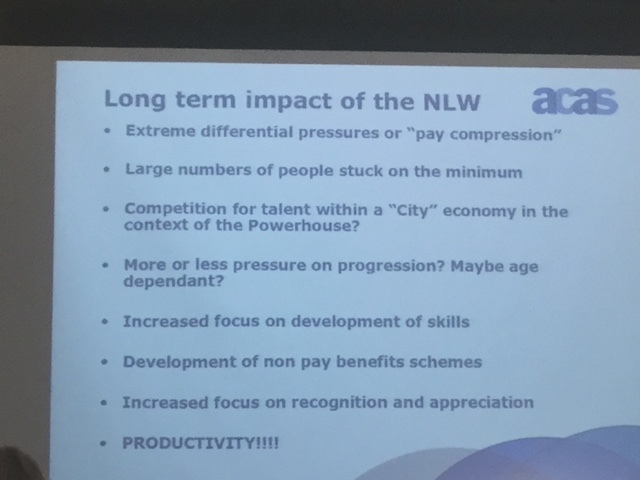 And yet, weren't some of these views expressed about the NMW too? Petes' final points were around the ACAS 7 Levers of Productivity, and he explained the origins and potential use of the model. Pete pointed out that a lot of this is common sense, but I guess we are all surprised by how often organisations ignore or just aren't aware of them. Much of the seven levers overlap with the levers for employee engagement as set out in the Macleod Report, and this no doubt delliberate as engagement ought to equal productivity. Still, though, it's a good model and the inclusion of an online diagnostic is good and something I'm going to investigate further as a way of starting discussions in the workplace. The final talk was from David Birchett, TLT, covering upcoming employment law changes. 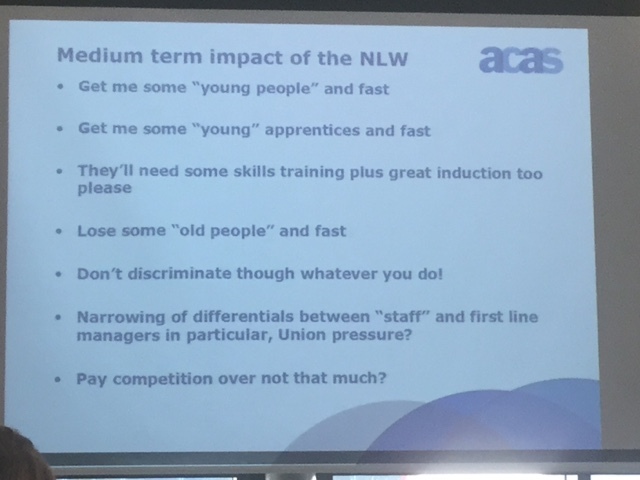 David started by covering the changes to trades union legislation, which have been covered elsewhere but are still a bit unclear to many and developing. He also covered changes to family friendly legislation particularly as regards the tightening up of the treatment of women on maternity leave facing redundancy, changes to the tax and NI treatment of termination payments and ongoing developments on working time, zero hours contracts and holiday pay. I find it difficult to blog about employment law and make it interesting sometimes. I've tried my best during today's session and I hope you've found it useful. Overall the day and event have been good and a useful update, although employment law is a dry subject and one that becomes increasingly difficult to digest the later it gets in an afternoon. I haven't a solution to this problem, but there's no doubt that the energy levels plummeted at the mid afternoon break. Ps in other news, #connectinghrmcr is coming up on 7 April - it falls on the day I get back from holiday so I'm hoping to attend and ought to be able to make it, so maybe I'll see some of you there.